Small, unbroken blisters can be left uncovered and will usually heal on their own. The exception -- if a blister is in an area where it might get rubbed, such as on the sole of the foot. In that case, protect the blister with a soft dressing to cushion the area. For a broken blister that has drained, protect it from infection by covering it with a bandage. A sprain means a stretched or torn ligament, while a strain involves an injury of a muscle or tendon. The signs are pain and swelling. In addition to icing the injury, wrap it with an elastic compression bandage and keep it elevated when possible. In some cases of severe sprain or strain, surgery and/or extensive physical therapy may be needed. Seek medical help for burns if they are severe, on the face, or bigger than 2 inches. For treating small minor burns at home, rinse the area in cool water. Never use butter, grease, or powder on a burn. After rinsing, cover the burn with a thin layer of antibiotic ointment. Then bandage it. A nonstick dressing is best and you may need tape to hold the dressing in place. If the edges of a cut are separated but will go together, use a butterfly bandage to close the wound. This type of bandage should be placed across the cut, not along its length. If the wound is long, more than one bandage may be needed. Seek professional care for cuts that are gaping, longer than a half inch, or don't stop bleeding after 15 minutes of pressure. After surgery, you'll need to keep the incision site clean and dry. Change the dressing according to your doctor's instructions. Each time you remove the old dressing, check the wound for signs of infection, such as increasing redness around the wound, a yellow or green discharge, or an unusual odor. Skinned knees or elbows can be awkward to cover. Larger-sized bandages or adhesive bandages with wings can hug joints and move with you. Another alternative: Use a liquid bandage. This will stop minor bleeding and protect the wound from dirt and water. Liquid bandage is shower-resistant and only needs to be applied once. Scrapes that cover a large area should be kept moist to help promote healing. Antibiotic ointment or moisture-enhancing bandages, also called occlusive bandages, can do the job. Some scrapes don't form a scab as they heal, but remain shiny and raw. If this occurs, wash the wound with clean water and apply a fresh bandage regularly. Watch for signs of infection. Fingers, heels, and knuckles move so covering them can be tricky. But you'll want to keep them covered to keep dirt out. Bandages that are hourglass shaped or notched so they are shaped like an "H" can prevent folds and bunching. Or they can wrap around a fingertip for full coverage. The hands and feet are exposed to more dirt than the face, so it's best to keep cuts covered. Bandaging can also prevent shoes and socks from irritating wounds on the feet. 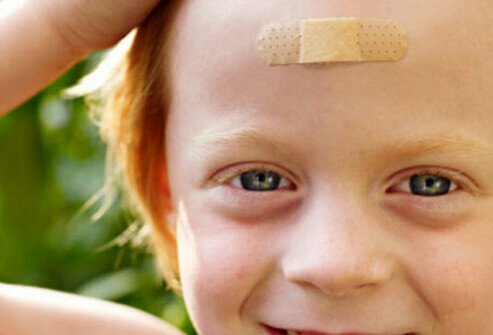 Adhesive strips can be used for small cuts, but be sure to change the bandage if it gets wet or dirty. Seek medical help for deep cuts or puncture wounds on the hands or feet. Call your doctor for deep cuts, puncture wounds, or injuries that don't stop bleeding after several minutes of pressure. Adults should call a doctor about getting a tetanus shot if they haven't had one in the past 5 years. For children, check with your doctor. And always look out for infection. Seek medical care if a wound becomes red, painful or swollen, or if it continues to drain, especially if you have a fever.